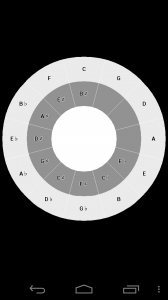 I hope that a Circle Of Fifths-style widget might be a better presentation of the most useful subset of these possibilities. Of course this shows enharmonics rather than relative scales, but whatever. The not-so-colorful — but currently working — picker is shown over there to the left. 1. The Scalculator can simply pick a random figure out of its database. 2a. Don’t be afraid of double accidentals. The means lots of craziness. With this off, it won’t intentionally generate a double accidental, but combinations of notes might come together to produce them. 2b. Extended intervals. You can include 9ths, 11ths, 13ths and so forths in the generated figure or not. 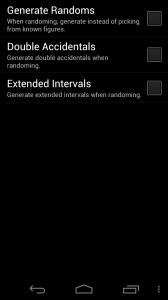 Of course, the result is not truly random and I might tweak the generation parameters as time goes on. By the by, testing the random figure generation exposed a bug in the engine which I fixed as well. So that was handy. Anyway, those are the big features that will go into 1.3 – everything is working I just need to polish it a bit. Scalculator – Free Edition up!